A 10-man Australian side managed to draw with Japan in a controversial and exciting game of football in Brisbane last night. Defeat was on the table after the Socceroos suffered a blow when referee Khalil Al Ghamdi sent off substitute Mark Milligan in the 57th minute after he kicked a Japanese player from mis-timing a volley kick. Keisuke Honda capitalised on Australia’s misfortune with a beautiful cross to Yuzo Kurihara who managed to get the ball past 39-year-old veteran Mark Schwazer’s safe pair of hands in the 63rd minute. Controversy broke out when Al Ghamdi awarded Australia a penalty after Japanese Atsuto Uchida apparently grabbed Alex Brosque’s shorts, leaving Japanese fans speechless. 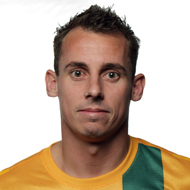 Luke Wilkshire managed to bring the game back on level playing terms with a striking penalty in the left corner, giving the 40,000-strong crowd something to cheer about. The Socceroos suffered an early blow in the 11th minute with midfielder Mark Bresciano leaving the pitch injured after he suffered a suspected groin injury. More drama occurred in the dying minute of the match when Kurihara was sent off after a second booking, leaving Wilkshire unable to score a second goal from a long-range free kick. Socceroos’ captain Lucas Neill was pleased not to lose but also thought Australia could have won. “We would have taken the draw before the game,” he said. “It’s been a tough two weeks and the way things went with the red card, we had to dig in and then we conceded an unfortunate goal. This was Australia’s second consecutive draw in the space of the week after drawing with Oman last Friday in 41 degree temperature. Socceroos’ head coach Holger Osieck made a surprising pre-game move by choosing not to start giant striker Josh Kennedy in the starting side. Osieck only made one change to the side that drew with Oman on Friday by bringing in star Everton striker Tim Cahill for Harry Kewell. Before the game Japanese officials were understood to be unhappy with the Suncorp Stadium playing surface, which copped a whipping in last Saturday’s rugby match between the Wallabies and Wales. Australia’s next World Cup qualifier will be against Jordan as they continue to qualify for the 2014 World Cup in Brazil.